Feeding a family is always a challenge. 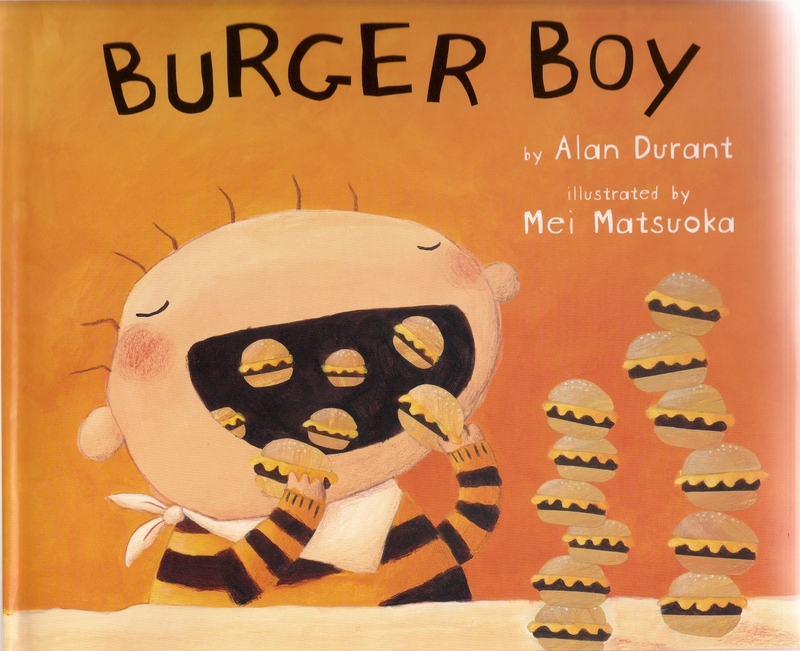 Take Burger Boy by Alan Durant. Burgers are the only thing Benny wants to eat. He eats so many he turns into one, and that’s when the trouble begins. Then there’s my family. They just like to eat, and that’s when the trouble begins. The Stefanec side of the family was at our house for dinner this past weekend. I carefully planned what I thought was a great Wisconsin taste treat for those members who live on the east and west coasts. We began with several Wisconsin cheese appetizers to tease the taste buds. For the main course, we had a barbecue. There were racks of ribs, brats with a variety of condiments, chicken breasts, corn on the cob, homemade potato salad (my mom’s recipe), cole slaw, Jay’s Potato chips (a special treat for my Florida sister), and for dessert we had a traditional family favorite – Jell-O cake (decorated in a patriotic manner with blueberries and strawberries by my daughter). Of course, we also had a large variety of adult and kid-friendly beverages. There was so much food I knew I would be in leftover heaven for the next few days. Wrong! I miscalculated the eating power of my family. The food magically disappeared from serving dishes to plates. The Stefanec Clan then proceeded to inhale their dinners. When a request was made for more, I checked pots, pans, and containers and informed them there was no more food in the inn. That’s when family members began grabbing uneaten corn from other people’s plates, and someone who had a rib section left took a bite of it and tossed it back into the serving dish to be passed along for others to nibble on – which they did. As I watched my crazy family pass, toss, and gobble food, I thought of something we used to say, “Would you eat like this in the White House?” Of course not, but we can do it here because we’re family. In Burger Boy, Benny learns his lesson and switches from eating burgers to eating vegetables. I guess I learned my lesson, too. Don’t count your leftovers until everyone has licked their share of the platter clean. I love my family. We’re not stuffy. We’re just stuffed! This entry was posted on July 12, 2011 at 7:19 AM and is filed under Laughter, Life. You can subscribe via RSS 2.0 feed to this post's comments.